In case you weren’t present at the Boise State v BYU game on October 6th, you need to know that Cosmo the Cougar put on an incredible show for the fans. And also that it’s turned into something of a competition. After the video went viral, Cosmo the Cougar became the star of the game. The Washington Post even chose him as a theme in their article the next week. Cosmo and the Cougarettes danced to Ayo and Teo’s hip rap advertising Rolex. On their most recent trip to Utah (playing against Utah University) the Oregon Duck took the opportunity to post a video on Twitter to compete for best dancing mascot. Looks like Cosmo the Cougar has some competition. The next day, BYU fans posted a video of BYU’s game against San Jose State. 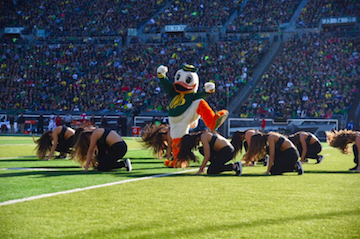 Well, not the game so much as Cosmo’s epic response to the Oregon Duck. So it looks like Cosmo is still winning. We’ll see what other mascots dare to compete.